Certainly a statement piece, the eternity band is a ring with a continuous line of identically set diamonds in a band of precious metal. The Eternity Band is a symbolic gift, usually given by a husband to his wife on a significant anniversary. The ideology behind the ring is that it is a never-ending band of love, representing eternity. The history behind the Eternity Band however is very different from the sentiment. In the 1960’s, diamond merchant De Beers controlled the diamond supply channel and had a secret agreement with the Soviet Union. In order to keep this so called monopoly over the industry, De Beers agreed to buy 90 percent of the uncut gems produced by Russia. Because these stone were typically much smaller than the average solitaire stone in engagement rings, De Beers fashioned the Eternity Band to market towards married women. The idea took hold, and soon this was the most desired anniversary gift. The company fashioned a campaign around the idea with the slogan, “ She married you for richer or poorer. 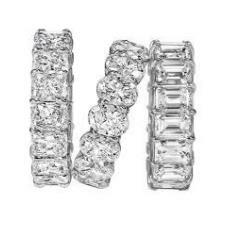 Let her know how it’s going.” Today the Eternity Band is seen as a classic and essential gift on important wedding anniversaries.